Our award winning SONOMA blend has a bold smoky flavor, with a subtle olive finish. This naturally wood-smoked extra virgin olive oil is extraordinary drizzled over shrimp, steaks or roasted artichokes ... the list is really endless! SONOMA’S smoky flavor is so versatile it’s an irresistible combination with practically any seafood, vegetable, meat or egg dish. Chef LaNoue even has a fabulous recipe for “Grilled Nectarines, with Gorgonzola Dolce”. 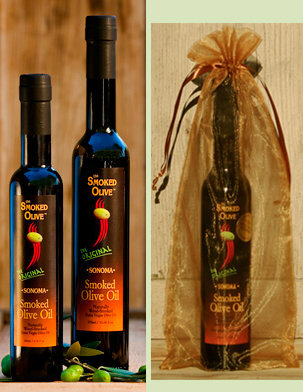 SONOMA Smoked Olive Oil is made from fresh, premium CALIFORNIA olives. Our unique smoking process (patent pending) preserves the flavors and integrity of the olive oil, for quality you can taste. Ingredients: Naturally Wood Smoked Extra Virgin Olive Oil.